Whereas Sluggo there is no Nancy-boy. Wait, why is it in black and white? 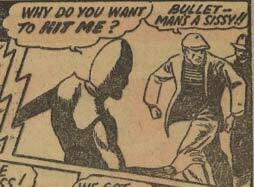 Did Bulletman use to run in Bulletnewspapers, and only a full-color version on Bulletsunday? It’s actually kind of cool, apparently they did a limited set of two-color (black and red in this case) free inserts for some ad campaign or another, each featuring an actual adventure of the main character. Oh, okay. That’s pretty interesting. Bulletman used to sell Arm and Hammer? That’s like, the best product placement in reverse ever. BULLET!man was BULLET!-punched by the BULLET!-thug!? BULLET!-NOOOOOOOOOOOOOOOOOOOOOOOOOOOO!